The Boston Celtics fell 118-115 to the Philadelphia 76ers in an instant classic between two Eastern Conference rivals. After leading by as many as 15 in the second quarter, this is a game that simply slipped away from the C's. With Gordon Hayward out and in the league's concussion protocol, the Celtics were going to need a full team effort in order to secure a win on the road. And Boston got off to the type of start that they needed to do so. The C's started the game on a 11-3 run, which included a 3-3 start from three point range. As has been the case since this BOS-PHI rivalry has heated up, this game was incredibly physical throughout. Bodies were flying, and the refs were letting them play to start. Boston was dishing it out on the defensive end, and was even getting away with a few fouls. Both teams knew the implications of this game, and they certainly came out playing like it. After hitting their first three shots from beyond the arc, Boston missed their next four, and Philly was able to put together a run to tie the game 21-21. 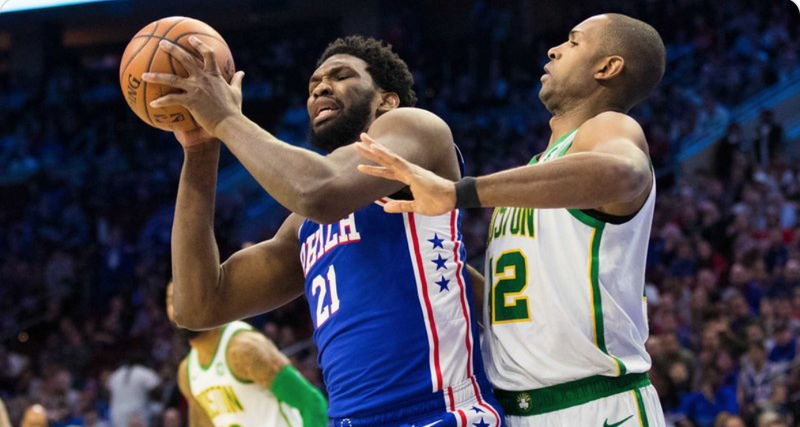 Joel Embiid, having constantly heard about his past struggles against the C's, came out on a war path, and, along with Tobias Harris, were the main contributors for the 76ers early on. Kyrie was great (16 points, 6-for-10 shooting), the Celtics executed so sharply, and it's 39-30 after one. Not to be outdone, Kyrie Irving was simply sensational in the first quarter. Even with a star-studded starting lineup and multiple All-Stars, Philly just doesn't have an answer for Irving on the defensive end. Kyrie made a specific adjustment in his game early. After getting switched onto Embiid, Kyrie continually shot the ball before Embiid could reasonably contest the shot. After Philly had closed the gap, Boston reestablished their hold on the game to end the quarter. The C's ended the first on an 18-9 run on the back of Kyrie's wizardry and their ability to push the pace, which resulted in a number of open looks, especially against the Philadelphia second unit. The Celtics carried their momentum into the second quarter, where Al Horford and Terry Rozier took over. Horford started the quarter with consecutive and-1 layups against smaller defenders, and Rozier added 11 points on 4-4 shooting in his first eight minutes in the game. The second quarter was a clinic, and the second unit plus Horford was dominant. Not only that, but it gave Kyrie an extended rest while not having to worry about losing the lead they had established. During their run in the second, the Celtics had an unreal streak of 11-12 shooting, and seven shots in a row at one point. When everyone is rolling for this team, it's almost impossible to stop. The Celtics are shooting 63.9 percent from the field almost midway through the second quarter and are already up to 58 points. They have 30 points in the paint and eight 3-pointers. Just a clinic from their offense so far. Boston scored 69 points in the first half, and took an 11-point lead into the halftime break. Three free throws with time expired from JJ Reddick put a bit of a damper on the lead, but that was easily one of the best halves of basketball the Celtics have played all season. Tempers boiled over as the second half started. While getting back in semi-transition, Embiid dropped a shoulder into Marcus Smart's chin, which went uncalled. Smart then got up and two-hand shoved Embiid in the back, sending the big man (flopping) to the ground. Embiid was assessed a technical foul, and Smart was ejected after receiving a flagrant 2. With Hayward out, Smart ejected, and Aron Baynes missing the second half of the game with a sprained ankle, Philly harnessed the emotions of the scuffle and were able to slowly chip away at the Boston lead. Unfortunately for the NBA fans who love aesthetically pleasing basketball, the Sixers run was anything but that. With the refs presumably trying to clean up the game, Embiid was able to get to the free throw line over and over again. Embiid about to take his 19th free throw attempt right here. Sheesh. Philly got the Boston lead as low as three midway through the third quarter, but Boston was able to extend the lead back out to 10 before Reddick nailed two threes to tighten things up once again. Smart has historically been a very good defender of Reddick, so no doubt he was excited to see him tossed. The Sixers used a horrendously slow 21-12 run to eviscerate the Boston advantage, and take their first lead 85-84 with just over two minutes to play in the third. But the Celtics were able to stem the tide late in the third with an 8-3 run in the closing minutes, four of which came from Semi Ojeleye, who contributed well off the bench. Man, these have been some rock solid minutes from Semi Ojeleye here. Although Boston took a 5-point lead into the final frame, Jimmy Butler was the story of the fourth quarter. Rozier continued his hot scoring night to help the Celtics push their lead as high as nine, but three straight threes from Butler, who had scored just seven points up to this point, demolished the Boston lead and tied the game 105-105. Butler scored 15 points in the fourth quarter, but the Celtics were able to keep up thanks in large part to the shot making of Kyrie and Horford. But an and-1 layup from Ben Simmons put Philly up by three with 40 seconds left, and a Butler jumper sealed the win for the Sixers. A frustrating loss for sure, and one the Celtics definitely could/should have won. Nothing we saw tonight should convince anyone that Philly can beat the C's four times in a playoff series. Pick things up, and get back at it. Finish the regular season strong, and prepare for the grueling Eastern Conference playoffs.